This book makes for a very good source of inspiration and research. The author, Amid Amidi, has created a book of depth and scope, just like he did for The Art of Robots. The chapters are arranged alphabetically. Each showcases an animation studio, with the background and the art. The 50s cartoons were extremely stylized. In fact, looking at this book, it reminds me of The Art of The Incredibles, which contains very stylized concept art. 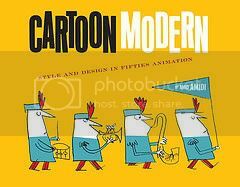 The wonderfully varied collection of cartoons come from commercials, TV programs, films and the printed media, covering a wide selection of genres. You'll get to explore and read from lesser known studios to animation giants like Disney. This book should probably create nostalgia in people who grew up watching and reading cartoons. It's a wonderful book for animators and cartoonists.